YLOC La Palma will be hosting our 3rd Annual Math Competition on February 11th, 2017! This competition will consist of three tests of varying difficulty based on grade levels. The test itself will be an hour long, and after completing their tests, the students can enjoy playing fun games and eating delicious pizza until the Awards Ceremony begins. Be there or be square! From the location of YLOC Fullerton and Music Branch, Maple Center, we decided to make a mini library in the name of YLOC. We need your donation of books in order to make the mini library successful. We accept like-new condition used books that are not damaged heavily. For 5 hardcover books, we will give 2 volunteer hours, and for 10 softcover books we will provide 2 hours as well. On the day of the Book Drive Event, we will get together to create labels for the books and make a list of books we have. Hours will be provided to those who participated in this event as well. Date and Time: 5/30/15 Saturday, 9 A.M. to 11:30 A.M.
As you all know, the new PSAT that has changed has been confirmed and announced. There were a lot of people that were wondering about the newly changed SAT and PSAT and so we gathered up professionals who will explain the changes in the tests. This is different from the lectures that we will be providing for the tutors. We will meet in 5/23 at the Buena Park Senior Center. Time: 5/23 (Sat.) 1:30 P.M.
As many of you may know, Nepal has went through a 7.8 earthquake on the Richter Scale. 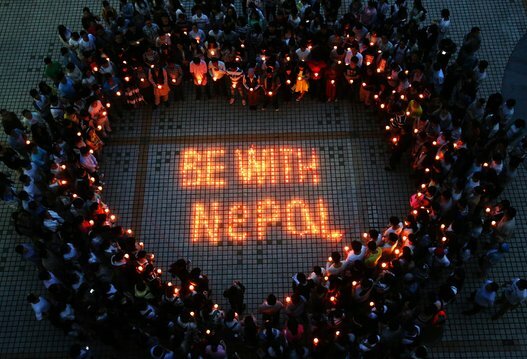 More than 5,000 people have lost their lives and tens of thousands lost their home during the incident. We want to help Nepal by selling wristbands to raise funds to donate to those in need in Nepal. YLOC will start selling the wristband starting 5/8 (or the 9th) and we hope to see many of us participate in the fundraiser to help Nepal through its hard times. If you have any questions about the event, feel free to contact your branch/chapter's officers. if you stay the whole 6 to 11, then 1 more hour will be given, thus equaling to 11 hours. *please bring all the things that you want to sell to your own chapters.